That’s what Paul Kulik kept hearing when he described the inkling of an Old Market restaurant idea he dreamed of opening. That idea became the Boiler Room, which opened to much fanfare — and a fair bit of skepticism — in 2009. In 2016, this-ahead-of-its-time restaurant has settled comfortably into its spot in our city’s dining scene. It’s one of Omaha’s most adventurous and creative dining experiences. Preheat the oven to 350ºF. Poke holes in the sweet potatoes and bake in a covered baking dish until very tender, about 45 minutes. Remove from the oven and set aside. Once they are cool enough to handle, peel and roughly chop. the sweet potatoes through a food mill and reserve. Place the milk in a small pot and season with the salt, nutmeg, and cayenne. Heat the milk to a near boil, then add the flour and reduce the heat to medium. Stir the mixture with a wooden spoon until the flour and milk form a ball. Transfer to a stand mixer fitted with a paddle attachment and beat on medium speed for 10 seconds to release some of the heat. Add the egg and mix on medium speed to incorporate. Add the yolks one at a time, then continue to mix until the dough forms a stiff mass. Mix in the milled sweet potatoes, then transfer the dough to a pastry bag fitted with a star tip. Heat about 6 inches of oil to 350ºF in a large pot. Carefully pipe five to six 3-inch lengths of dough into the pot. Fry until golden brown, about 7 minutes. Remove with a slotted spoon and drain on paper towels. Continue piping and frying in batches until all of the dough is used, making sure the temperature of the oil returns to 350ºF before frying a new batch. 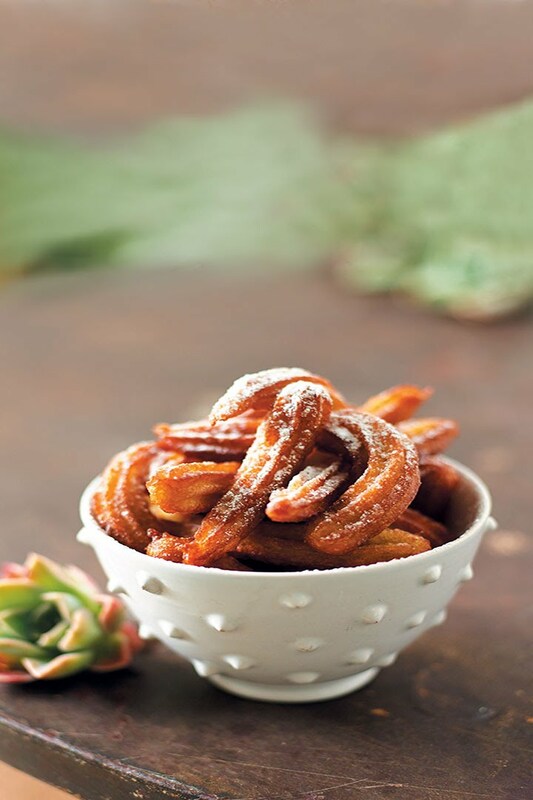 Season the churros with salt and baking spices.